Portable compactors consist of a self-contained packing head connected to compaction container. When the container is full, the entire unit is transported to the landfill to be emptied. The remote power unit remains at the installation site. Marathon's portable compactors, such as the RJ-250SC, have been the standard of the industry for more than 35 years. Quality, service and reliability are what make Marathon the best choice. Shopping centers, malls, large restaurants, large supermarkets, hospitals, hotels, cafeterias, resorts and other high liquid content applications will benefit from a portable compaction system. Wet waste, self-contained compactors offer many features and benefits. 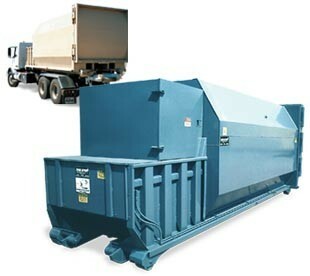 They are designed to handle large volumes of wet waste as well as mixed wet and dry waste. The liquid retention capabilities help keep odors and liquids off the ground. They help reduce disposal fees by requiring fewer pickups by local trash collectors. One container replaces many open-tops. They also help control pests and improve housekeeping by enclosing the wet waste in a liquid tight sealed container. Contact Marathon for a free site survey and consultation to determine the right size, model and accessories to meet your special application and requirements. Related products: stationary compactors, compaction containers, chutes & hoppers, cart dumpers, StreamLine option. Marathon Equipment Company, a Dover Company, P.O Box 1798, Vernon, AL 35592. Tel: 205-695-9105; Fax: 205-695-8813.